Pulling together the contrasts of this beautiful Scottish Borders region by first appreciating it with a bird’s eye view of the Tweed Valley from the Eildon Hills, followed by a well-deserved pub lunch. Day ends, walking around Dryburgh Abbey, arguably Scotland’s most beautiful set beside a river and visiting some intriguing, hidden statues. - Coffee in Scotland’s largest, historic square of ancient Kelso. 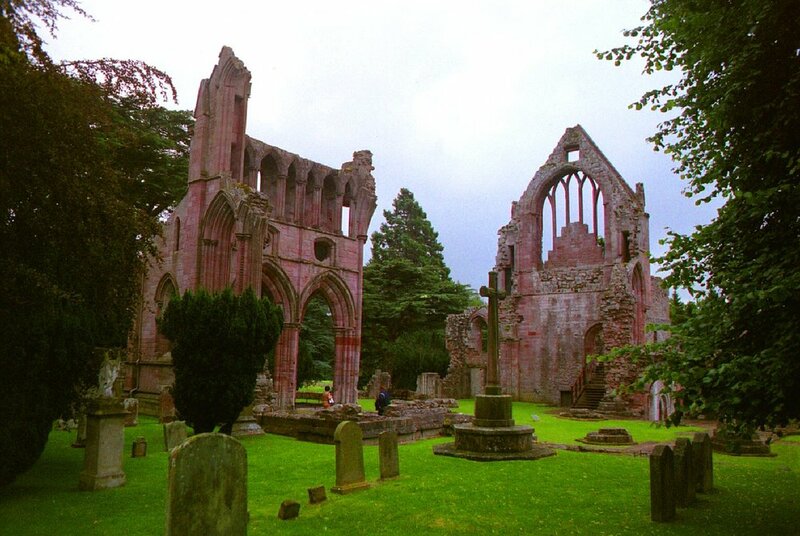 - Walk around the comprehensive ruins of Dryburgh abbey in its peaceful rural idyll beside the River Tweed. Grading: Easy along well-defined paths. - Short walks to a little known statue to Scotland’s national hero, Wallace, and to the Temple of the Muses. Cost includes admission to Dryburgh Abbey but excludes food or drink.